Rodney Hood could be a big part of the Jazz's 2015-16 season -- if he doesn't get stuffed in a trash can by Kobe Bryant, anyway. It’s a brave soul who dares talk trash to Los Angeles Lakers guard Kobe Bryant. 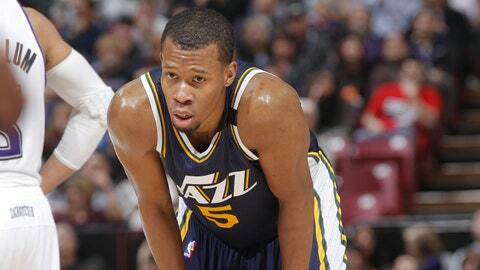 Consider Utah Jazz guard Rodney Hood just such a soul after a preseason game against Bryant & Co. last week. What did Kobe say to Rodney Hood in Tuesday's game? Hood: "He gave me his resume." Kobe to Hood: "I can shoot it 30 times—you can shoot it 10 times. Don’t try to go there with me." Hood smiled: "To some point he was right." Hood said there is a mutual respect between him and Kobe. You can’t argue with Bryant’s logic. If he takes all of his team’s shots, it’s just Kobe being Kobe. But if Hood tried to do the same thing, he’d be benched in a heartbeat. Bryant has unrivaled leeway. And he’s not shy about letting his opponents know about it.